How to Get an International Driving Permit in Hungary? The application may take place at any district Document Office, or the Central Document Office (Budapest District XIII, Visgerádi utca 110). 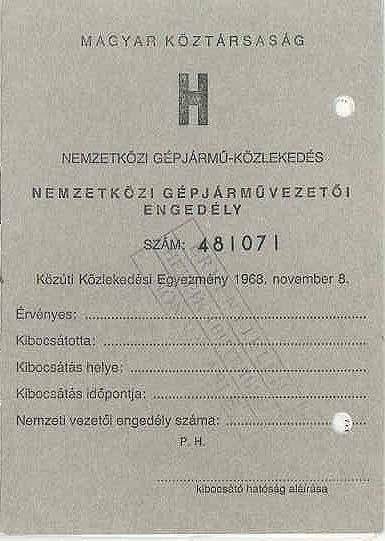 An international driver’s permit may be given to the owner of a driver’s licence, issued by the state of Hungary, or any other state which has joined the 1968 Vienna Convention on Road Traffic. The application may be submitted by the licence’s owner in person, or by proxy: in the latter case, the original power of attorney (“meghatalmazás”), written in Hungarian language and verified by the signature of two witnesses, should also be presented to the authority. The data contained within the international driver’s permit is regulated by Annex 7 of the Vienna Convention on Road Traffic, and is the same for all licence owners. – the service fee may be paid at the office by cash or credit card – the sum is 2300 HUF.